A recent update on YG-Life features Jennie Kim doing a cover to Wale’s “Lotus Flower Love.” As well a picture update of Jisoo. But despite the little news known about the group YG fans, particular Blackjacks, are not responding warmly to them. Blackjacks are genuinely worry that this new group will replace already preexisting 2ne1. Are the Blackjacks worries legit to think this newbie girl group will take the crown from queens 2ne1? Well sorta. The truth is that 2ne1 seems to be on top and most likely has reached their peak. Yet this doesn’t indicate that 2ne1 is falling from grace just need to expand onward in order to live up to their own hype. In the summer of 2012 2ne1 release their comeback single “I Love You.” A daring new image concept sense the group ditch their in-your-face attitude and settle down to be more sultry and sensational. 2ne1 did this after their stint in Japan 2011 that lead to a small mini tour. It was clear that 2ne1 has grown since their debut days and was trying to mature their image. The comeback was successful but short-lived as the group prepared themselves for their 9 city New Evolution World Tour. Making them the first female Korean group to embark on a world tour in the history of K-pop. The year 2012 was probably one of the best years, on a growth level, 2ne1 has ever endure. So why do Blackjacks still fear the end is near for their precious group? The issue is not that 2ne1 has manage to create a name of themselves through the media and touring but the lack of a U.S debut. Since 2010 2ne1 and American electro-pop producer Will.I.Am, along with Teddy Park, are collaborating an American single or mini album for 2ne1’s U.S debut. In 2012 2ne1’s “Take The World On” was not an official debuting single but was the first single produce by Will.I.Am. The track alone was less than the bombastic “I Am The Best” and a total generic sleeper. Way to similar to 2ne1’s Japanese singles “Scream”and remix to Madonna’s “Like A Virgin which equally lack so much spark and charisma. Whatever happen to 2ne1’s more aggressive dance beats? PSY is no idol rapper or pretty boy but a pudgy man who can horse dance. 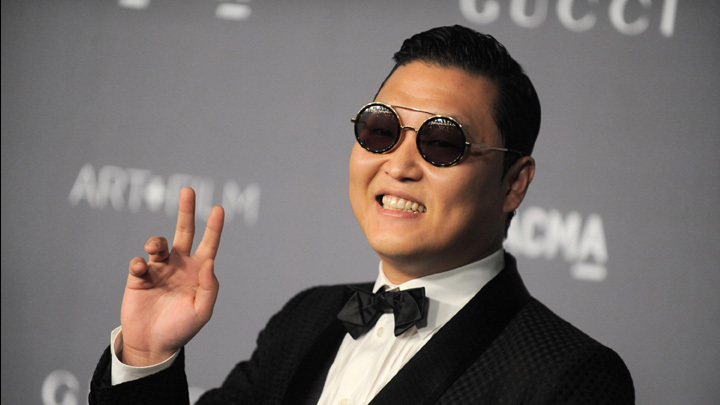 His silly music video “Gangnam Style” which makes fun of Korea’s wealthy elite was infectious. His unique look of wearing a suit and humorous approach to rap help him stand out from today’s artists. Whether or not American K-pop fans agree to PSY popularity as a freak of nature and ever furthering the image of the Asian male as a joke. In matter of months PSY surpass any K-pop idol star or group could ever dream of and didn’t change a single thing about his music or image. I don’t think 2ne1 is falling from grace but is reaching an obstacle in their careers. The lack of confidence in fans only shows that 2ne1 is missing something that will complete them as a whole. This new female group shouldn’t worry fans whether or not 2ne1 is coming back stronger but are they coming back more true to themselves than they were before. If anything the success and experiences that 2ne1 has endure on their world tour and meeting different artists from the west can only show through their music. You can suspect that YG is already in the works of creating a new single for 2ne1, so in the meantime all fans can do is patiently wait. The arrival of the new female group will only strengthen and expand YG’s brand power in K-pop. YG has to see success even after 2ne1 is long gone and still continue the tradition of making good music. YG fans forget that the first debut female group under this label was SWI.T and the second Big Mama. Both did not manage to be equally successful as 2ne1. But I doubt 2ne1 will be the last female group YG will ever produce nor are they ditching them any time soon. It is possible for a record label to have more than one female group be successful? Fans need to realize without this ability I feel its YG who will fall to the wayside not their idols. Movinh this blog to tumblr for the time being. Easy to post and share thoughts,music and media. There is a reason why I haven’t been updating my blog on the regular. I still don’t have internet at home. It takes quote a deal of time to independently blog but also some money. Lately my life for the past year has been rather hectic in other responsibilities haven take me away from blogging about K-pop. I don’t not want to shut down my blog since things are becoming more in order. Between me trying to get into school and dealing with my mother’s debilitating illness I’ve been rather stress at the moment. I really like my blog and develop a great interest in creative writing also business. Well I’ve always been into entertainment business and wanted to create a blog that isn’t afraid to discuss those issue along with other political and social regarding K-pop and the Asian-American entertainers here in the U.S. Although I’m not Asian myself I always do quite a deal of research to be respectful. I’ll be back soon kids with more things to fangirl to dish about. My main focus is K-pop expanding into western hemisphere and how international fans are supporting but also hindering the advancement. As well the marketing strategies and pitfalls. I can’t wait to get back at blogging and share my thoughts. Thanks You to those who are reading despite the lack of updates. I have the nasty case of club fever and finding jams to satisfied my craving. So here are my fave tracks to make sure night will keeping going even if nobody understands the Hangul.